15% Off Spring Vacation Cottage Sale, Hiking, Biking, Fishing and Canoeing at Montfair Resort Farm! Website: Click to Visit 15% Off Spring Vacation Cottage Sale, Hiking, Biking, Fishing and Canoeing at Montfair Resort Farm! Montfair's Spring Vacation Sale- Now through May 31, 2019! Enjoy 15% off all nightly cottage rental rates and an additional 15% off all multiple night packages. Call 434-823-5202 for reservations or book online. 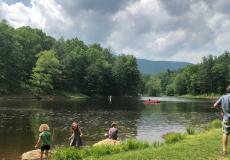 Comfortable, clean cottages with everything you need, overlook lake near the Shenandoah National Park, the small town of Crozet and Charlottesville, VA. WiFi in all cottages. Enjoy onsite nature trails, canoes, bikes and fishing on family owned property. Pets are welcome. Call 434-823-5202 or book online.